We've got lots going on in the studio this Sunday with guest designers, Erika, Melanie, and Noelle. 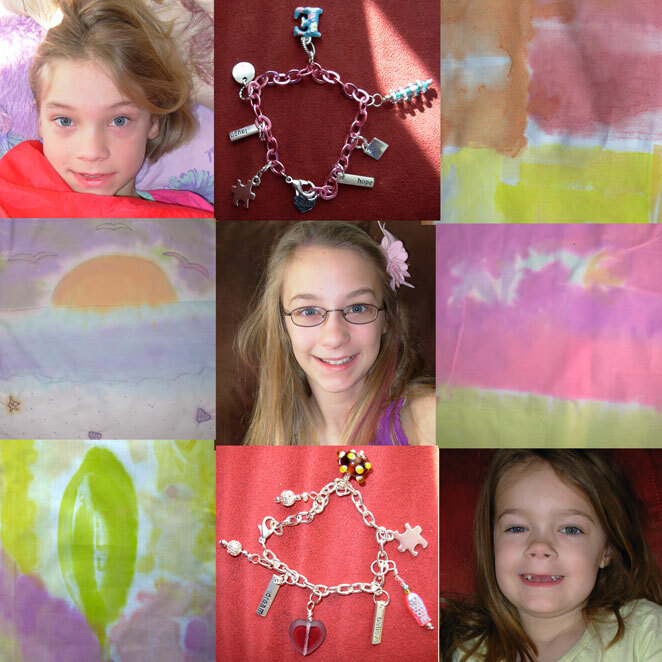 A little fabric painting, quilting, and charm bracelet jewelry making, we've been super busy! We have filled our bellies with chocolate chip, blueberry, and quinoa pancakes along with fresh strawberries, and we are good to go! I will be creating a little later on (if there is any time left in the day.) Have a wonderful day! I'm surprised that I am not someone with a green thumb. You would think that as inspired as I am by all things floral that I would be planting flowers everywhere I go just to be surrounded by them always. Well, it's not the case. 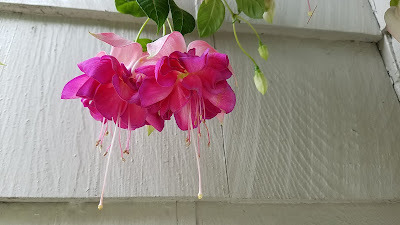 However, yesterday I did purchase a fuchsia plant so I could look at it up close and take pictures. Nothing amazes me more than the incredible beauty of flowers! How does something so beautifully complicated happen so easily in nature? How does a single blossom contain so many petals that ripple and bend not to mention different colors and shapes? In just one blossom???? I am completely mesmerized by this plant! Every single bud is a hidden treasure waiting to explode into this incredible dance of color and movement! Yes! It has taken me quite a while to get my "stuff" together here but I'm finally DONE!!! 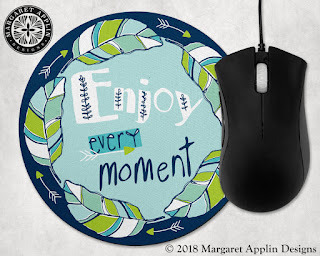 I am soooo excited to share with you my brand new website, www.margaretapplindesigns.com, which incorporates my old blog (because I couldn't possibly part with it and all the content from 2008 to present)! What an adventure it has been so far setting this up (and I'm not sure it's 100% perfect) but I'm really ready to go with it! The first offerings are MUGS, MOUSEPADS, and PILLOW COVERS. I have to give a huge shout out to Kathy Weller who's guidance has been critical as I make my way through this maze of e-commerce. Some of you may remember I used to sell my thermofax screens off of Etsy. Well, Etsy has come a long way since then and my next challenge is to also load up my products for sale there as well. Did I mention, my shop has FREE SHIPPING!!!!! YES!!! Everyday!!! Every item!!! To tell you the truth, I wasn't sure this would be the best time to write about this moment in my life, a moment that happened in June 2017, but now I'm thinking, why not? First, let me state that I recognize myself as a spiritual person now, however that wasn't always the case. I was (and still am) a very stubborn, hard-headed person who believes she is right about most everything and it wasn't until more recently that I softened my perspective on certain beliefs I had. I also want to say that it wasn't just this one event in my life that changed my perspective. I turned 50 last year and many things changed!!! Not all for the better LOL! I was kind of free-floating in 2017. I had kind of lost my direction and wasn't really sure where I was going with my art. I was trying to figure out just how important it actually was to me and how much effort I wanted to make with it going forward.